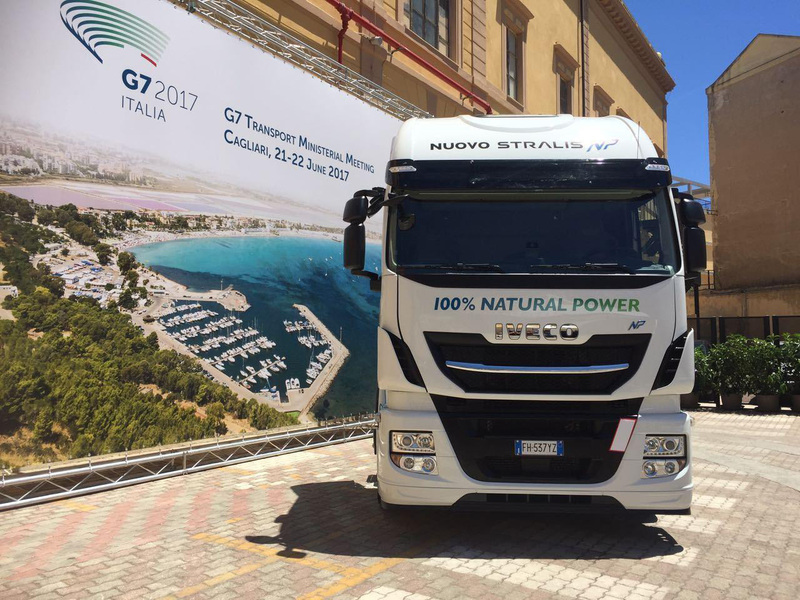 Iveco has demonstrated the advantages of LNG as a heavy vehicle fuel to transport ministers in Europe at G7allery event in Cagliari. IVECO has taken part in the inauguration of the G7allery, an exhibition devoted to innovation that presents the best projects on sustainability applied to the world of infrastructure and transport. The G7 Transport’s opening event was promoted by the Ministry of Infrastructure and Transport. IVECO presented its vision of the future of transport together with representatives from the Ministry of Infrastructure and Transport and major institutional and private stakeholders. The presence of a Stralis NP powered by liquefied natural gas (LNG) is testament to IVECO’s commitment to the development of alternative fuels and transport technology to optimise fuel consumption. The Stralis NP is designed for long-distance haulage and offers up to 1,500 km of autonomy. It can reduce NOx emissions by 32%, PM by 99% and CO2 by up to 95% when using biomethane. IVECO is the only manufacturer that offers a full range of natural gas models, from light commercial vehicles to heavy-duty long-haul trucks, as well as buses. The brand was the first manufacturer in the world of commercial transport to understand the potential of natural gas. It anticipated some of the most important recommendations of the last G20 Energy Ministerial Meeting 2016 in Beijing, which recognised that natural gas can be a less emission-intensive fossil fuel, and that it can play an important and effective role in moving towards a low greenhouse gas emission energy future. IVECO also anticipated the European Union Communication “Strategy for low-emissions mobility” published last year, which stated that Liquefied natural gas for heavy duty vehicles is strategic for Europe. It also provides a solution to most of the issues we face today: local air quality with its extra-low NOx and PM emissions, and noise. In addition, the Directive on Alternative Fuel Infrastructure (DAFI) (April 2014) foresaw the build-up of infrastructures for alternative fuels/tractions across Europe and the development of common technological specifications, which included those for CNG and LNG refueling points. In preparation for the G7 Transport, a meeting of experts in the transport and logistics sector – promoted by the Ministry of Infrastructure and Transport – was held in Rome on 12th June. The discussions touched on topics related to environmental, economic and social sustainability, telematics applied to transport and “smart roads” for vehicle connectivity, and mobility of the future. Minister Delrio closed the discussion and, after the meeting, he boarded a Stralis NP, a virtuous example of environmental and economic sustainability that is already available today.